Zucchini + Breakfast Prep = Win! 08 Aug Zucchini + Breakfast Prep = Win! August has arrived and so have the wagonloads of zucchini! This time of year, my garden floweth over with zucchini and I begin to run out of friends and neighbors to share my bounty. While this lovely summer squash is in season, enjoy it, along with the health benefits it provides. The lutein and zeaxanthin are antioxidants that promote eye health. 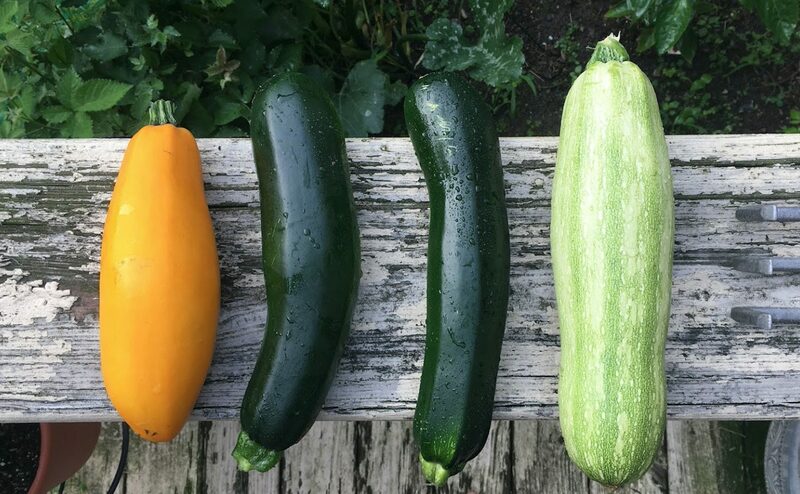 The manganese, zinc, and B vitamins zucchinis are packed with serve in blood sugar metabolism support, and what’s more, the soluble form of fiber found in zucchini helps keep blood sugar glucose levels in balance. Fun fact: the seeds have been used in traditional medicine for their anti-microbial properties. The humble zucchini– who knew?! Since my overflow of zucchini aligned with back-to-school supply shopping, I thought a marriage of back-to-school prep and zucchini-bunda recipe would be a nice idea. And what I mean by back-to-school-prep is avoiding the reality jolt of breakfast time on school days. Parents, you know the drill: summer schedules have crept in and despite your best intentions to get the kids back on a school schedule (in bed at a reasonable hour, awake before the time the bus will be leaving on school days), it just may not happen. Anticipate it. The first day of school will come with lots of excitement, maybe new outfits, and even a Pinterest-perfect lunch. That enthusiasm may wain by week’s end, and this is where I come in, bearing a breakfast cookie featuring, you guessed it, zucchini. Muffins and breads are familiar carriers of our summer squash friend, but a cookie– that’s an unexpected twist and for those who may have to take a breakfast that travels well, it’s easy to eat and tidier than quick breads. And who doesn’t like a cookie?! 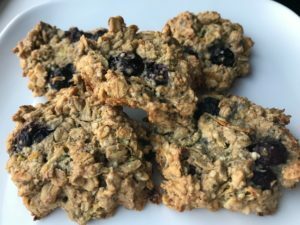 Of course, it’s ME, so this is cookie is packed with nutritional goodness, including hemp seeds for brain building Omega-3s, oats for fiber, and anti-oxidant powerhouse blueberries. This recipe is gluten and dairy free, making it an option even for households with dietary restrictions. My suggestion is to make a batch or two (or more, depending on your haul of zukes) of these well before the first day of school. You can then freeze them and have a lovely breakfast option for you and/or your kiddos on even the busiest of harried mornings. You will thank yourself later. Reminiscent of an oatmeal cookie, this recipe works well with any number of add-ins. I added pepitas (shelled pumpkin seeds) for a food-as-medicine mood booster. Feel free to add you favorite oatmeal cookie add-ins to make this recipe a favorite. Blend the banana and dates with the coconut oil, vanilla extract, and maple syrup. Then whisk in the egg and zucchini. In a separate bowl, mix together the oat flour, oats, baking powder, hemp seeds and cinnamon. Add to the wet mixture until thoroughly combined. Gently fold in the blueberries. Scoop the batter onto the baking sheet, making cookies of about 4 to 5 inches wide. For a crispier cookie, flatten the batter. For a more cake-like cookie, keep it mounded. Bake for 30-35 minutes or until golden brown. Refrigerate in an airtight container up to 3 to 5 days. Freeze for longer storage. Enjoy cold, reheat in the microwave or bake in the oven if you prefer it a bit crispier. Bake in a muffin tin for about the same time, or a mini-muffin tray for about 20 to 25 minutes. No Zucchini or Not Enough? Oat flour can be made in your high-power blender. Typically, 1 cup of regular oats will blend down to 3/4 cup oat flour. Use spelt flour or all-purpose flour (gluten-free optional) instead. Substitute blueberries for chopped apple, raisins or other dried fruit, nuts, or seeds. If you or your tribe is accustomed to a sweet start, these may be initially better received with chocolate chips. Stir in 1/2 to 1c. chocolate chips. With chocolate, the higher the cacao, the better: look for 70% or greater. Feel free to add more spices, including more cinnamon, ginger, or nutmeg.